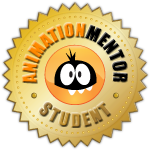 You've been accepted as a student at Animation Mentor. Awesome!!!! I am accepted at Animation Mentor. I did not think of being so happy one day in the reception of an e-mail. I begin, as other students, at the end of September, and I will try to update this blog best which I can.